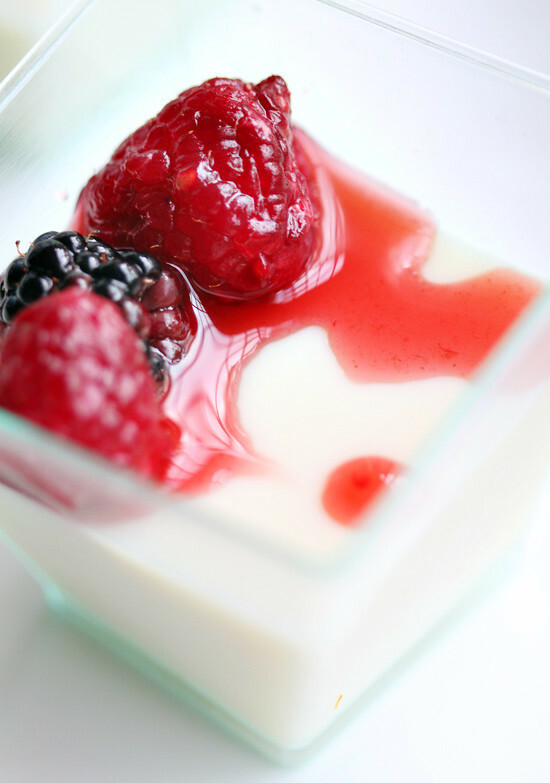 Soy Milk Panna Cotta with Red Wine Sauce and $100 American Express Gift Card Giveaway! Recently Los Angeles has been hit with heat waves that made us constantly hover around the AC and brought back nightmares of our short time living in the scorching desert of Phoenix, Arizona. Serious cooking was the last thing we wanted to do. Our solution to cool down? This dessert we’re calling soy milk panna cotta that takes minutes to prepare and you barely have to turn on the stove. It’s not a classic panna cotta since there is no cream or dairy, but instead soy milk is substituted. Simply dissolve some gelatin in cold soy milk, chill, and then top with your favorite syrup for a quick dessert. It’s also a riff of one of our favorite Vietnamese desserts, dau hu nuoc duong gung, or tofu with ginger sauce, which is typically served warm. Instead, we opted for fresh summer berries in a simple red wine reduction. 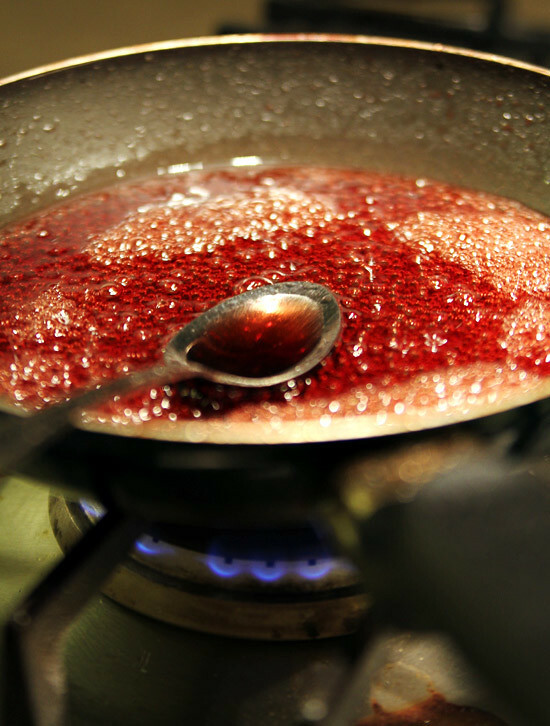 Again, barely any cooking involved–just simply heat red wine with some sugar until thickened and toss in the berries. After a thorough chill, top with sauce and enjoy! A fantastic way to beat the late summer heat. Divide the soy milk in half, placing half in a small sauce pan and half in a bowl. Add a packet of gelatin to the bowl and allow to sit. Heat the sauce pan gently only to dissolve 2.5 tbs of sugar. Turn off heat and add the warm soy milk to the cold soy milk along with the vanilla extract and stir until the gelatin is completely dissolved. Transfer to individual serving ramekins/bowls if desired. Allow to set in the fridge for 2 hrs. Heat 1/2 cup of red wine with remainder of the sugar until dissolved and reduces in half. Turn off and remove from heat and toss the fresh berries to coat and cool in the fridge. 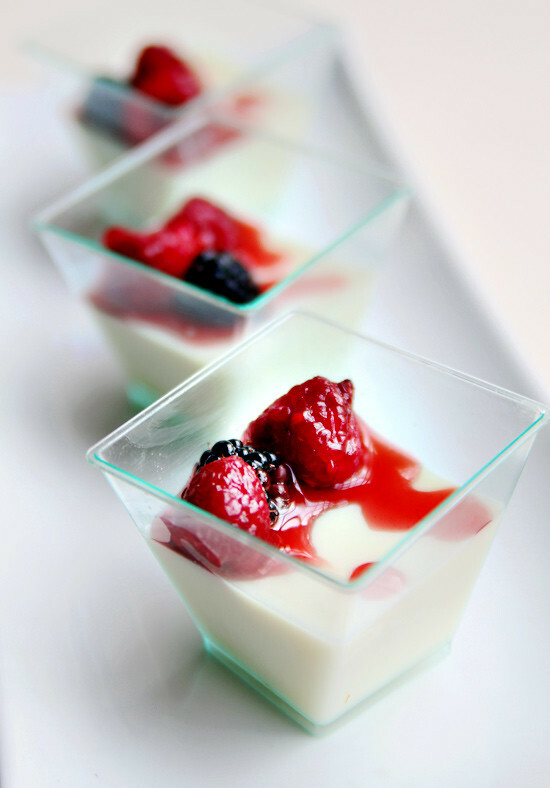 When thoroughly chilled, top soy milk panna cotta with red wine and berries and enjoy. Fortuitiously, Foodbuzz Tastemakers and American Express have generously sponsored this post as part of their Dinner@6 program. The challenge was to create a dish with 6 ingredients or less. As part of the Dinner@6 contest sponsored by Blue Cash PreferredSM, American Express provided us with $100 gift card to give out to one lucky commenter. Sound off in the comments by 9/30/11 at 11:59 pm EST for your chance to win. See this link for official rules. Great recipe! I love healthy dessert recipes, thanks! I can’t wait to try this at my nexts dinner party. I’m not a huge fan of panna cotta (I’ve tried it over a dozen times) but this easy dessert sounds delish & simple. I just may try panna cotta for my 13th time! Plus, I know my boyfriend will devour the dessert since he LOVE’S all desserts! i *love* panna cotta but am lactose intolerant so this is perfect!!! thanks for sharing it! Looks great! Love the easy-to-follow instructions and the photos are always amazing! Looks refreshing! Thx for the great pictures! Dessert with wine integrated…and maybe a glass of port with it? Um, YES!!!!!! This sounds soy-milk panna cotta sounds delicious. I wonder if almond milk or rice milk would also work? I have friends who do not eat soy but might try this if I made if from almond milk. I also wonder if blackberry brandy would work in place of the wine? yes, any of those milks would work as well as brandy/port etc! good luck! This looks easy and delicious! Can’t wait to try it, especially since I love dau hu nuoc duong gung but never had panna cotta before. the texture is really really similar! I love panna cotta but I also love tofu desserts. You guys are simply amazing cooks and come up with the most wonderful recipes. But I want to also point out that you guys take great photos! Pictures on your blog are always so vibrant and captures the beauty of the cooking process, not just the final product. Truly talented! Looks delicious! Love the Red wine sauce. This looks yummy, and doesn’t appear unhealthy either! I’ll definitely be trying this out soon. I am very excited to give this recipe a try. Looks so good and healthy… thank you for sharing. 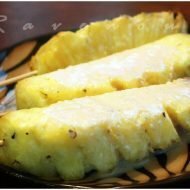 Great recipe and so simple! Love the red wine and berries combination! It look delish. I make my own soy milk at home and this is the perfect recipe to use up the extras. This looks so good! I’m inspired to make it tonight! I can’t wait to try making this, the pictures are so pretty! This looks delicious and so much healthier than traditional panna cotta! I can’t wait to try this! Panna Cotta is my favorite! Thanks for the recipe! Such a great idea and so simple to make. I’ve never thought of eating the tofu ginger dessert cold. This is such a good fusion idea. Love it! Thanks for sharing. What a great idea, especially since I can’t have too much soy if at all any. I will definitely have to try this. Thanks, again. Looks delicious! This is definitely on my recipe to do list. Thanks for the great idea! i’m going to try this with the nuoc gung and see how it turns out. thanks for posting the recipe! Perhaps this dish will make my fiance a tofu eater! It looks wonderful! Congrats! You’ve been randomly selected. Please respond within 24 hours with your name, address, phone number, and email address, and confirm that you are over the age of 18. So creative! Thank you for the easy & great recipe! Thank you for posting this! I’m lactose intolerance and this is a perfect dessert recipe! I can’t wait to try it this weekend. Like the other recipes you post, I cannot wait to try this. It looks amazing! Yummy! I can’t wait to try this recipe. Not only it sounds good, but healthy too. I love panna cotta! Thanks for the recipe. I LOVE LOVE LOVE dau hu!! It’s my favorite dessert too!!! I’ve never had panna cotta though. I have to try it sometime and make a video blog on it! Your blog is an inspiration for me to try out new recipes. I recently came across your site when Tuna Toast mentioned it. I’m now a huge fan! I just love your recipes and stunning photography. I’m definitely going to try this panna cotta recipe. It sort of reminds me of that great tofu-centric restaurant in Reseda, Vinh Loi. Sounds like a yummy recipe! As a lactose intolerant Asian American, this recipe looks delicious! I’ve always been afraid of panna cotta because it looks deceptively good to me, haha, but yours makes it look so tempting! I may have to make this and eat panna cotta once and for all, :D.
This looks so amazing… I love food, but I’m just starting to finally get into cooking. So this is an easy recipe, nothing too special, but it’s a fun way to spice up a chicken meal. It’s so yummy with a side of mashed potatoes. Heat oil in pan, add garlic and onions and cook til translucent, add chicken breasts and grill over medium heat until nearly browned on both sizes, sprinkle with seasoning salt and add mushrooms to pan. Turn heat to low, sprinkle each chicken breast with some shredded cheese, and then cover with skillet lid. Allow cheese to melt then serve immediately. I love panna cottas! Can’t wait to try this recipe! mmmm love how you used soy milk! this is fantastic and the berries and wine on top and beautiful. Easy recipe, cool contest, great giveaway! Thanks!! this looks delicious and so refreshing! “Dau hu” with a new twist! Love it! Love the pictures. Luckily temperatures here in My part of Arizona have dropped significantly thanks to the showers we are having for past two days. But one doesnt need a hot weather to try this! I have a housewarming party this weekend.. may have to try this out! Does it matter which type of soy milk? Like the ones you get at asian stores? Or the ones you can get anywhere now? Sounds delicious and healthy! I like the idea of berries over the traditional sugar syrup. This looks delish! All the Vietnamese recipes are making me homesick for my mom’s cooking…and for my mom, of course, haha. Thanks – you guys are awesome! Looks absolutely delicious. I am going to have to try it. That looks delicious. I have been meaning to try making a panna cotta. I picked fresh raspberries today! Such a great use for them! what a great idea for those who are lactose intolerant. Thanks for the wonderful recipe. ps. This ain’t no bribe to get the AX card or anything but if ur ever in Hawai’i, please don’t hesitate to drop me a line. Time to put away the almond Jello! Oh yum this looks good. I am going to have to make it. 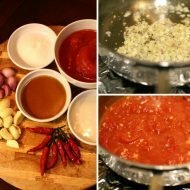 I would love make the dau hu nuoc duong gung as well. I even have the agar agar in case of the “need” for it. This looks so good! Can’t wait to try it, great twist using soymilk instead. Oooh, I never thought to use soy milk in panna cotta. This sounds delicious! Beautiful presentation. Will try this recipe very soon. That looks so good. I will try this recipe this weekend! Hi Anh Chi!!! Great post. I’ve always admired your photos! Have you ever cooked with konnyaku jelly before? 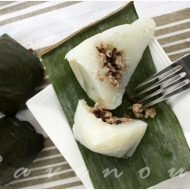 Most Vietnamese use it in Rau Cau Trai Dua. It’s almost chewy and doesn’t melt like jello and isn’t tough like agar agar. My family loves it. Great Post. Cheers! I’d love to try this at home! Love your site. Great simple recipe. I have barely began cooking. Is there a way to substitute the red wine part? Or is that a must for this particular drink? Great idea. Will def try! Crap, just realised this isn’t a So Good recipe… just linked to BY So Good. Woops, ignore my comment! I do want to try this! Question: how many grams of gelatin in a packet? 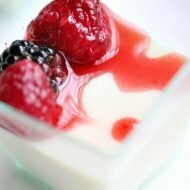 Awesome panna cotta recipe! thanks a bunch! Wow, never made or had panna cotta, but this looks great. This looks great! I’m definitely trying it!! Sounds Delicious! On my list of things to make! Great recipe! I love soy desserts and wine, so this sounds like a perfect marriage! Love this recipe and what a great giveaway! I never thought of using a red wine sauce with panna cotta. i like quick recipe can’t wait to try it this weekend. Thx. Such Mouthwatering pictures! Never had panna cotta before, but definitely gonna give it a try after this post! What a great dairy-free alternative! This looks easy and soooo delish. Can’t wait to try. Wow – this looks perfect – it’s fresh, light and clean! Love it and all with only 6 ingredients! wow! looks refreshing! just the thing to say goodbye properly to summer! Such an easy and very elegant dessert. I love everything in this recipe except the gelatin! Could I do it with agar agar? I have found a brand that I think is more stable than gelatin. Humm. Now I want to make marshmallows. Love the colors and freshness. This sounds like a dessert from a restaurant! I like that it uses soy milk, and the red wine sauce looks amazing. Nicely done. I’m going to give this one a try. With our kids, maybe I will replace the red wine with berry syrup. Have you considered using agar? ooh…can’t wait to try. I love your site! My favorite 6 ingredient recipe is one I found on the Bisquick website and I make all the time! I bake my potatoes first, sometimes the day before. Peel when cool. Chop bacon into small pieces and brown in pot. Remove from drippings and set aside. Simmer garlic (I use 3-4 pods, minced) and one chopped onion in bacon drippings until transparent, about 5 minutes. Next, add two cans of chicken broth and the potatoes that have been chopped into small pieces. I also add a bit of water to get he right proportion of liquid to potato. I let this cook for 45 minutes or so until the potatoes have started softening and dissolving. At this time I use a masher to mash until I get the consistency I want. I stir in half and half about five minutes before I serve, and I also add the crumbled bacon at this time. never tried this before, but sure does look yummy! i’m going to have to make it! Yum, that looks delicious! Can’t wait to try this recipe! Sounds delicious! I have never tried making Panna Cotta – thought it would be too hard. Delicious! It looks so pretty as well! Love your pictures! makes my mouth water! Wow, your recipe is beautiful. So artistic too. It’s such a wonderful creation for late summer. Here’s my family’s favorite 6 ingredient dinner. Hope you’ll like it too. In a pot of boiling salted water, cook noodles until al dente. Drain and set aside. Heat a large skillet over medium-high. Season steak with salt and pepper. Cook, turning once, until medium-rare, 3 to 5 minutes per side. Transfer steak to a cutting board and loosely cover with aluminum foil (reserve skillet with juices). Add snow peas to skillet and toss with juices. Cook on medium-high heat, tossing occasionally until crisp-tender, 2 to 3 minutes. Add noodles, soy sauce, and cream cheese, cook until warmed through, about 1 minute. Transfer to serving bowls. Slice steak and place on top of noodles. Sprinkle with green onions and enjoy. Thanks for your recipes. They are great! Do you have a recipe on how to make soy bean drink from scratch…soy beans. We live in a small city in France and I can’t get fresh sua dau nanh for my kids. I would like to make this drink for them. This looks delicious!! I’ve never made panna cotta but would love to learn how!! Cook the pasta according to directions, lightly saute the cubed tofu with olive oil, toss the spinach in with the warm pasta once it has been drained, stir the spinach in with the pasta and add the rest of the olive oil, stir, toss in the tofu with the pasta, stir, toss the cheese in, stir, salt and pepper to taste… Enjoy! Cook pasta according to package instructions. While the pasta is cooking, saute the onion and garlic in olive oil over medium heat, then add the chopped tomatoes. Season with salt and pepper, to taste. Cut the mozzarella into bite sized pieces, drain the pasta (when it is al dente) and toss everything together. Top with the chopped basil and you are good to go! For the wine reduction. Is there a way that you can do it w/o the wine or alcohol? yes, of course, your your favorite fruit juice instead! I’ve made panna cotta many times but never with soy milk. Does it taste completely different? Looks delish, healthy and simple. Best of of all worlds. I think I’d use agar instead of geletin and could there be a substitute for the red wine, if so what would you recommend?